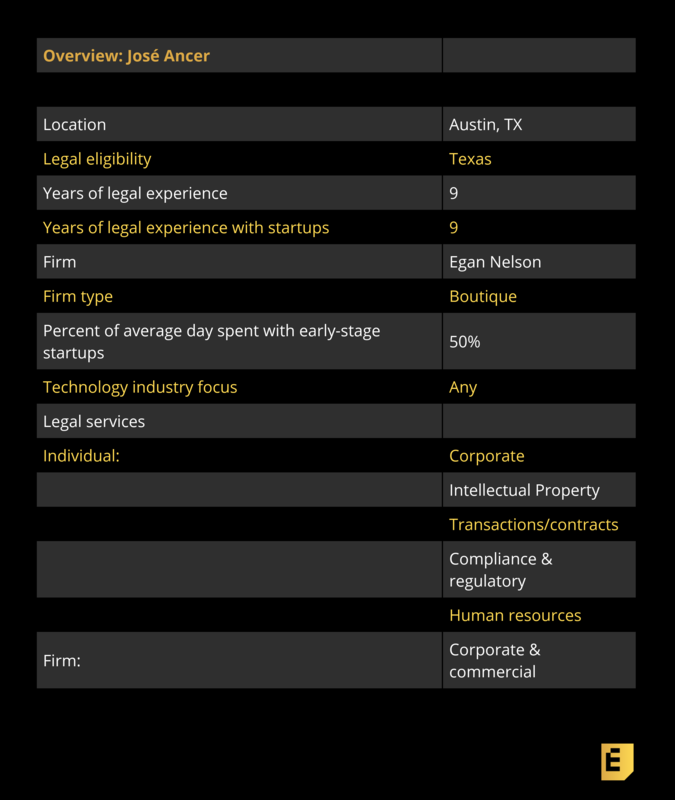 José Ancer is first of all a startup lawyer, with a client portfolio of startups of various stages based around Texas and other similar ecosystems outside of Silicon Valley. He’s also the CTO of Egan Nelson LLP, a boutique firm, where he actively is also building automation software to help the firm compete against larger firms. He also writes on his blog “Silicon Hills Lawyer” publicly and pointedly about his profession — and often takes shots at certain practices common among startup law firms, including Silicon Valley firms. You can get a sense of what’s in the full interview via these excerpts. This article is part of our ongoing series covering the early-stage startup lawyers who founders love to work with, based on this survey we have open and our own research. If you’re a founder trying to navigate the early-stage legal landmines, be sure to check out our ongoing series lawyer interviews, plus in-depth articles like this checklist of what you need to get done on the corporate side in your first years as a company. Eric Eldon: You’re pretty outspoken about the state of startup law these days. Break it down for me: what is Egan Nelson doing differently from the other law firms out there? José Ancer: If you look at the startup legal market, everyone knows the marquee, high priced firms. They represent Facebook, Uber, Palantir, Apple, etc. But when you pay those firms $700 an hour, as an example, 25% ballpark is going to compensation for the lawyers doing the main work. 75% is paying for other stuff. So then the question obviously becomes, how much of that other stuff is really necessary? Our view is that there’s this segment of the startup market, and I call them non-unicorns, that is far more serious and scaled than what a tiny firm or solo lawyer can handle, but for whom BigLaw is completely overkill. We see these companies a lot more in places like Austin, Denver, Seattle, New York, etc., and it’s why our focus is on those markets. If you look at our lawyers’ credentials, you’ll see a whole lot of Stanford, Yale, Harvard, etc., as well as marquee firm alumni. What you won’t find at our firm is ludicrously expensive office space, cute events that have nothing to do with legal counsel, or armies of staff that don’t deliver real value to the end-service for clients. Our legal talent is paid very well, but our overhead infrastructure is designed for companies that sell as a private company for under $300 million, or perhaps operate indefinitely as profitable companies. These are “startups” that might be derisively labeled as “doubles” or “singles” in parts of Silicon Valley, but we think have been substantially underserved by the market.